Talk to Me... is a collection of 127 self-aware messages for partners to “flash” to each other in the midst of an upsetting interaction: “You didn’t do anything wrong. It’s my own craziness – trust me to get through it.” “I hate having to walk on eggshells around you.” “I love you. I hate fighting. And can’t we just hug?” Each flash card comes with field notes to help you navigate life’s messiest moments. This book is first-aid for a painful interaction, but more than that, a manual for staying true to yourself when you thought it impossible. It will make it safe for you to be vulnerable. It will let you speak from your heart without distracting voicetones. This is a guidebook to the real you, because it turns out that it is not really “telling you what to say” at all. It is only reminding you of who you really are, and trusting that you can take it from there. "Relationship gridlock, even when seemingly entrenched, can, actually be a springboard to intimacy when compassion is also present. 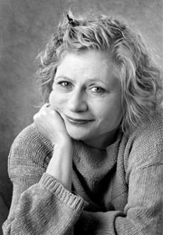 Nancy Dreyfus's ingenious repair messages are one of the most powerful and gentle ways I know to soften gridlock and get turned-off partners to actually start listening to each other." – Matthew Cohen, MFT., couples and family therapist, Plymouth Meeting, Pennsylvania. This book is GENIUS! 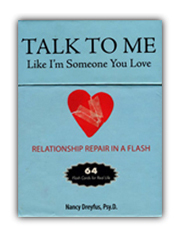 Couple's therapist, Nancy Dreyfus gives couples a fantastic tool!